Maxim Chudinov fired in a goal from his own blue line to give Avangard a 3-1 lead in its series against Barys. 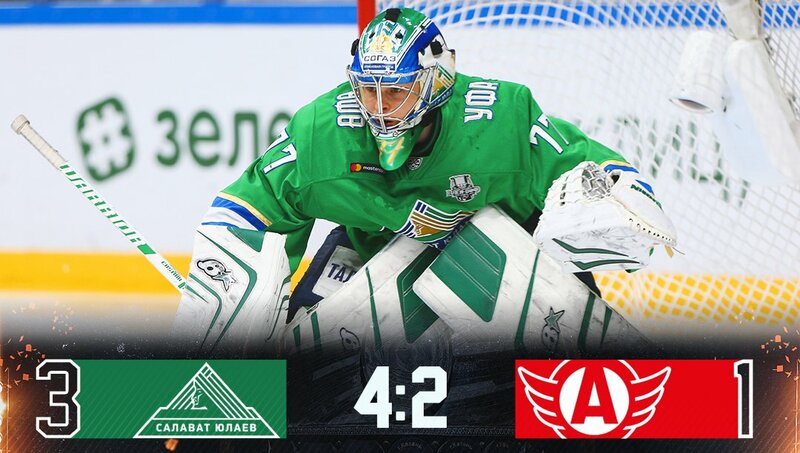 Salavat Yulaev produced wonders of their own, scoring four goals from just 14 shots on target to beat Avtomobilist. Both of today’s winners can conclude their series in game five on Friday. Salavat Yulaev is just one victory away from reaching the Eastern Conference final for the first time since 2016 after a second home victory against Avtomobilist opened a 3-1 lead in the series. Avtomobilist’s day began badly with the news that captain Nigel Dawes was unavailable due to injury. It did not improve: Dawes’ finishing skills were sadly missed as the visitor dominated much of the play but struggled to score the goals it needed. At the other end, meanwhile, Salavat Yulaev scored four goals from just 14 shots as the home offense produced a devastating performance from the scantiest of resources. At the other end, Juha Metsola impressed once again, making 37 saves to frustrate a visiting offense robbed of one of its key contributors. The Finn has allowed just five goals in four games against Avtomobilist, having faced 156 shots all told. A quick double blast in the first period set Salavat Yulaev on its way. The game’s first power play saw the host move ahead. Dmitry Kugryshev led the rush before feeding Alexei Semenov for a shot from the top of the circle that took a deflection on its way through traffic and past Jakub Kovar. A minute later it was 2-0 with Eduard Gimatov profiting from the hard labor of Alexander Kadeikin and Vyacheslav Solodukhin before shooting home from between the hash marks. Rocked by an early crisis, the visitor was unable even to consider a time-out; an unsuccessful appeal on the opening goal had cost Andrei Martemyanov that option. Admittedly, the next contribution came from Avtomobilist. Francis Pare, whose earlier penalty had started his team’s problems in the game, made amends with a 10th minute goal. Dan Sexton’s pace saw him chase the puck behind the net and feed Vyacheslav Litovchenko. His shot from the boards got a deft touch from Pare in front of Juha Metsola’s net and the game was alive once again. But it didn’t take long for the home team to burst up the ice and restore its two-goal cushion. Philip Larsen began the play behind his own goalline, releasing Teemu Hartikainen. The Finn slipped a pass to Linus Omark, who saw Larsen speeding up the ice alongside him and moved the puck wide to enable the defenseman to finish what he’d started. The intermission arrived with Ufa 3-1 up and in control of the game despite having just four shots in 20 minutes. The second period was the most evenly-matched of the game, with the home offense trading chances with its opponent on an almost one-for-one basis. However, the only game came from a defensive lapse. Avtomobilist failed to clear its line not once but twice; Teemu Hartikainen could not take advantage but Joonas Kemppainen made no mistake after Dan Sexton fired the puck onto his stick as he lurked between the hash marks. The goal survived a check for offside; Hartikainen was adjudged to be standing on the blue line as he retrieved the puck at the start of the play. In the final stanza, Avtomobilist took complete control of the play. At times it was Metsola vs the visiting offense as the shot count reach 1-16 in Avto’s favor. But the Finn has been in solid form throughout this playoff and he was in stubborn mood again tonight. A disciplined display kept Ufa’s goal safe until the 59th minute when Denis Bodrov, Dawes’ replacement as captain, saw his shot deflect off Vladimir Zharkov’s outstretched stick and the shoulder of Artyom Sergeyev before dropping behind Metsola. However, it was too little, too late and Salavat Yulaev assumed a commanding advantage in the series. Unfortunately we were half asleep at the start of the game. Our opponent was more aggressive from the off and we weren’t ready for it. Then we made a heroic effort to turn the game around by any possible means. The guys battled to the very end and the positive for us is that we scored that late goal and managed to win the third period. We’re hoping that will continue into the next game, but right now that’s just a hope. Where were Dawes, Kucheryavenko and Mamkin? We weren’t in tip-top condition when we came here. Both Dawes and Mamkin were struggling with infections and spent all day yesterday on a drip. Kucheryavenko is injured. But we’re happy with the players who replaced them today. Why did you withdraw Kovar from the net? It’s a best-of-seven series, we wanted to give him a break. How come you had almost twice as many shots as Salavat Yulaev? The best indicator in the game was the blocked shots: they had 28, we had maybe half a dozen. That speaks of a team’s will to win. And, even though we had so many shots, Metsola was brilliant today. We had a good start. We thought we had the game won in the first period and after that we didn’t play with the same aggression as at the beginning. We managed the game, maybe we yielded the initiative but we defended well. And all the guys took responsibility for that; 28 blocked shots speaks volumes about how much we wanted to win today. What’s the situation with Anton Burdasov’s injury? He’s only just started training away from the ice, right now we don’t know when he’ll be fit to play again. Another hard-hitting playoff encounter saw two players ejected from the game as Avangard took the verdict thanks to two goals from defenseman Maxim Chudinov. He scored twice in the third period to snap a 1-1 tie and put the Hawks on the brink of progress to the Eastern Conference final. The first period finished goalless, despite a concerted effort by Barys to force the pace. The visitor spent more than twice as much time on the attack and was ahead on the shot count, but Avangard’s defense rose to the challenge and blocked 11 shots at Igor Bobkov’s net. Things changed in the second period, with Avangard taking the lead in the 28th minute. Alexander Yaremchuk, still only 19 years old, picked the perfect moment to get his first goal in KHL action. The teenager, who joined Avangard in the summer after leaving Ugra, was the beneficiary of a no-look pass from Mikhail Fisenko and duly fired a one-timer low beyond Henrik Karlsson in the Barys net. That lead was short-lived. Just 30 seconds later, Avangard lost Viktor Stalberg after his crunching hit on Valery Orekhov left the Barys man prone on the ice and was cited as boarding by the officials. The visitor quickly converted the power play; Matt Frattin surprised everyone with a shot to the far post from a tight angle that left Bobkov clutching at thin air. Avangard survived the rest of the penalty kill and came close to regaining the lead in the final minute of the middle frame. Cody Franson tested Karlsson and the rebound went to Sergei Shumakov for another attempt before the goalie regained control of the situation. Next came Chudinov. Russian language scholars will be aware of the word ‘chudo’, meaning ‘wonderful’, ‘miraculous’, even ‘freakish’. Today’s game-winner was undoubtedly a ‘chudo-goal’ from Chudinov. There seemed to be no danger for Barys as Avangard held the puck behind its own net and changed on the fly. However, when Chudinov brought play forward to his own blue line he looked up and saw a vast and tempting expanse of space in front of him … and let fly. The puck kept low, skimming over the ice and bouncing wickedly between the hash marks to wrong foot Karlsson and slam into the back of the net. Delight and amazement for the home support; bafflement and despair for the visitor. For a few minutes Barys went flat, deflated by that improbable strike. Gradually the visitor recovered and looked to find a way back into the game once again. However, as it did so, a counter attack led to the killer blow. Shumakov, always dangerous in this series, went haring down the ice with Darren Dietz in hot pursuit. Dietz did a fine job of pushing the puck away from his opponent but followed it with a needless shove from behind that left Shumakov crumpled on the ice as the stretcher bearers came to take him away. Dietz was ejected from the game, leaving his team short-handed for five of the remaining 6:19 and all but extinguishing his team’s hopes of saving the game regardless of the effectiveness of the home power play. In the event, it took a matter of seconds for Chudinov to smash home a shot from the top of the left-hand circle to make it 3-1 and wrap up the win with more than five minutes left on the clock. Now, he and his team-mates will hope to conclude the series in Astana on Friday. I’d like to thank my team for their performance. It wasn’t an easy game, both teams put in a huge amount of work. I don’t anticipate any further issues from the game, but sometimes there are passages of play that don’t work out the way we, as players and coaches, would wish. We’ll do everything we can to bring the series back to Balashikha; I can’t say whether it will be enough. Do you feel that Darren Dietz let his team down? I wouldn’t say anybody let us down. It was a normal hockey incident. Let’s look at what happened. Two players are racing for the puck. Sergei slows down, Darren decides to use his body and they happen to be next to the boards. I think it’s accidental, I don’t think there was any intent to injure an opponent. It was part of the game and, I sincerely hope, it won’t result in any serious injury. So much happened today, it’s hard to know where to start. In the first period we didn’t skate as well as usual but, overall, we did OK. Before the second period there was a problem with the lights, nobody can say what impact that had on the game but I’m proud of my guys because they responded professionally and continued to play like they should. Our youngster, Yaremchuk, got his first playoff goal today, that’s a great achievement for him. Barys tied it up but in the third period Chudinov scored from the blue line and that was a real blow for them. When we got back to the locker room after the game, they’d already taken him to hospital. Right now they’re checking that he’s OK.